Devoted vinyl lovers wouldn't be caught dead without a vacuum or ultrasonic record cleaning machine. After all, cleanliness is an absolute prerequisite to enjoying the full potential of any analog rig. Anyone with such a machine likely has a favorite cleaning solution. Whether through experimentation, a recipe found on the net (hopefully not!) or a recommendation from a friend, each of us has chosen a record cleaning solution we like. I made that decision quite some time ago and have been using and recommending one brand of record cleaning machine fluid ever since. The product has served me well and I have had no reason to look elsewhere. However, over the last year or so my customers have asked how our recommendation compared with some of the other popular solutions on the market. I couldn't answer; I simply hadn't tried them. Using one solution for years, I hadn't taken the time to investigate the other choices, but the seed of doubt had been planted. Was there something better? I thought it was high time to bring myself up to date and sample the alternatives, clean a few records and educate myself. That’s where the “fun” began. I thought I’d take a Saturday afternoon, clean a few records and see what differences I could hear. A bit of thought brought me to the realization that having more than one listener would make the comparison more accurate, and a bunch more fun. So I e-mailed a few local golden ears to see who I could coerce into participating. The enthusiastic response blew my mind! Envisioned as an informal trial, the thought of offering the results to a wide audience threw a whole new light on the experiment and demanded a far more structured approach. Clearly, the testing methodology had to be much more rigorous and a greater number of listeners should make up the sample. I also decided that the test should be a blind experiment. These changes radically altered our "little evaluation," which had now morphed into a formal test. What had I gotten myself into? As we soon learned, this was not going to be a quick evaluation. Juggling schedules, vacations and the time constraints of the participants made the process a long one. Further, several of the listeners were out of the area so the records had to be shipped. It turned out to be quite a lengthy trial. I chose four fluids for the test, the ones responsible for the greatest number of customer inquiries. Those were: Disc Doctor, L’Arte du Son, Last RCM Fluid and Mobile Fidelity. There were a couple of fluids I would like to have added, but in hindsight, I’m glad I didn't. The complexity of the evaluation increased exponentially with the number of samples tested and I think any more would have been sensory overload for the testers. All but one manufacturer offers both a single step and a multi-step product. Since the great majority of my clients have requested a simple, safe method, we wanted to investigate the one-step process. The fly in the ointment was Mobile Fidelity, which offers only a two step method (Record Wash and Super Deep Cleaner). It’s a popular product and we felt it should be included, leaving us with no choice but to use both the Deep Cleaner and Vinyl Wash. That turned out to be a bone of contention as several testers felt this was an unfair advantage, suggesting records clearly benefit from a final rinse with purified water. I would have to agree, but the other option was to leave it out of the comparison altogether and I think that would have been a mistake due its popularity. You’ll have to decide for yourself how to adjust the results. Five brand new records were purchased for the test; Dave Brubeck, Time Out, on 200gm pressings. The thought behind the choice was that most audiophiles have heard that recording a zillion times and would be very familiar with it (my sincere apologies to the testers who no doubt now despise this disc!). All the discs were first visually inspected for any obvious scratches, abrasions or other surface issues. We played each once to be sure there was not an inordinate amount of surface noise that might skew the results. Four of the five records were cleaned, each with a different fluid, leaving the fifth as an untreated control. Cleaning was done on a brand new VPI 16.5 vacuum record cleaning machine. To avoid cross contamination, a new pickup tube and applicator b rush was used for each fluid. Two of the manufacturers (Last and Disc Doctor) provided a specific applicator which we used with their cleaning solution. The records were cleaned following the manufacturers’ directions, if any were given. We were very careful to clean each record in the same manner – equal number of revolutions under the brush and the same number of turns under vacuum. This held true for all but Disc Doctor Quickwash, which came with very specific instructions. After vacuuming, the records were allowed to fully air dry before being inserted into their (rice paper) sleeves. We did note that there was quite a bit of difference between the way the fluids behaved on the surface of the LP. Some tended to bead while others created an even film across the record. The reason for this difference has to due with whether the manufacturer chose to include a surfactant as part of the formula. A surfactant reduces surface tension, allowing the fluid to spread and form a more continuous surface. There are those that believe this chemical leaves behind a residue and therefore a telltale sonic signature. We had no way to test that theory as the differences between the formulations was surely greater than whether or not a surfactant was part of the mix. Since the record didn't appear to be fully wetted when using the beading solutions, the casual observer might assume that more fluid was needed. We resisted the temptation and used only the amount of fluid recommended by the manufacturer whenever instructions were given. There did not appear to be any visual differences between LP's cleaned with either type solution. What should be a simple calculation turned out to be more involved than we anticipated. In our tests, we found that approximately 3 - 5ml of solution was required to visually wet the record surface (starting with a fully “loaded” brush). However, some manufacturers gave specific recommendations (both Disc Doctor and Audio Intelligent recommend 2 - 3ml), while others simply suggested using enough fluid to “fully wet the record.” Obviously there’s a great deal of difference when figuring cost between fluids that require as little as 2ml and those requiring 5ml. For sake of comparison we’ve settled on 3ml, but you may find it necessary to use a bit more. (Note: It’s been our experience that people tend to use more fluid per cleaning when using products that bead, making it harder to tell when the record is saturated). Most of the fluids are sold by the quart, which works out to be 946ml. So we divided that number by 3 to find we can clean approximately 315 sides. Frankly, based on our past experience, that number seemed rather high. Inadvertent waste, spillage, evaporation and loading the brush or applicator, all mean fluid lost. Though it’s not an exact calculation, I estimate a quart will clean 250 sides, or 125 LPs. ** L’Arte du Son is sold as a concentrate and mixed 1:4 with water. The cost per LP depends on the quality of water used. Generic, store bought distilled water (not recommended by most manufacturers) works out to be roughly $0.13 per LP (according to the manufacturer). If you choose a high quality rinse from Audio Intelligent, RRL or Disc Doctor (at $25 per quart), the cost increases to $0.31 per record. *** You'll note this is a new entry which discuss at the end of the article. It was included in this chart so you could assess its cost compared with the others. Two things were surprising. First that the scores among the top competitors were very close and second was how well the control performed. I’m not sure what to make of this since anyone can easily hear the difference cleaning a record (with any of these fluids) makes. It’s repeatable and sells a record cleaning machine every time we demonstrate the improvement. My sense is that our brand new, high quality LPs simply had fewer contaminants to begin with. Even so, cleaning these brand new records resulted in very worthwhile improvements. Score sheets from each listener were tallied by adding together the ratings for each category then dividing that sum by the number of participants. The two-step Mobile Fidelity system scored the best, but again you have to take into consideration that the second step was surely a significant contributing factor. If price isn't and issue, then you might want to consider it, but other fluids scored very close and were significantly cheaper to use. Was this a perfect test? No. There are surely variables which could not be controlled, but I do feel it’s an honest stab at an extremely complex investigation. 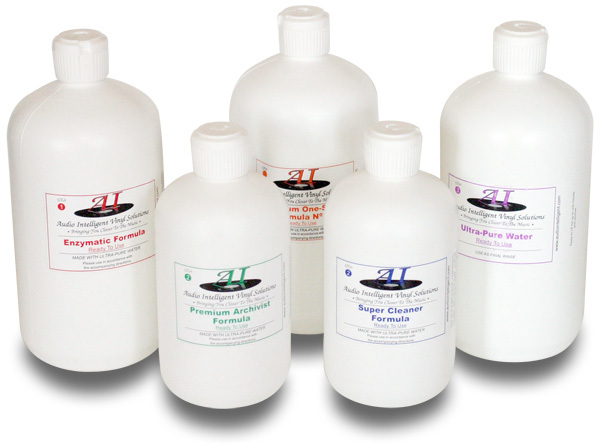 All of the fluids tested are excellent and were chosen for their popularity in the marketplace. Each has legions of followers who won’t be swayed by any test, and that’s good. Our suggestion is that if you’re using a fluid you’re happy with, stick with it. I don’t think the “rankings” here demean any of the solutions, and any one of them can become someone’s favorite. If you’re interested in experimenting, or don’t yet have a favorite, you’d be doing well to try any of the brands listed here. I do have one strong recommendation; if you’re using a home brew, stop! Absolutely, positively try one of the fluids tested here. Though inexpensive, the purity of materials available at the grocery store simply can’t match high quality ingredients used in commercial formulations (I can tell you from one who’s experimented with most of the mix-it-yourself recipes, professionally formulated fluids work better, period). If you think about it, the cost is miniscule when you consider the value of your collection. This not the place to cheap-out and save a few pennies. Make the most out of the time you invest in cleaning your collection and use a high quality product. As the testing was coming to a close another cleaning solution popped up on the radar. The Enzymatic Formula No.6 from Audio Intelligent Vinyl Solution is a ready to use, one step product. It's an enzyme-based formula and the first of its kind on the market. Feedback from early adopters was extremely positive, with several listeners I spoke with making the switch from their previously favored brand. So we decided to follow-up with a “mini test.” Taking the two best performing fluids from the first group, we asked two panel members to listen again, this time including the Audio Intelligent solution as the third. I thought this would be a good way not only to test the A.I. solution, but see if the first two fluids were again judged in the same order. They were very close. After all was said and done I decided to personally switch to the Audio Intelligent No 6 for routine cleaning. The majority of our customer's who tried the product have adopted, making it our biggest seller. The performance of the One Step No 6 is excellent, it's easy to use and modestly priced. For those want to go the extra mile, I recommend their three-step archival kit, which produces a spectacularly pristine surface; it is my new go to for reference-level cleaning. The three-step process gives me the absolute best results I've been able to achieve from a vacuum record cleaning machine. Below we've recreated the score sheet that was submitted to each listener. As you can see, this was a complex and very time consuming procedure. We were fortunate to find seven careful listeners willing to participate in the test. I want to thank each and every participant for their efforts! You will have five 200g records. Side one (and only side 1) has been cleaned, each of the four records with a different solution. The fifth has not been cleaned and is the control. Play side one of each record all the way through, twice, waiting 15 minutes between each play (it may be easier to just play one record then go to the next, eliminating the need to wait between plays). The record is now ready for play. Feel free to listen as much as you like. Please sweep each record with the Audioquest carbon fiber brush before and after each play. Note your findings on the enclosed score cards. Please grade each record in each of the categories, scoring on a scale of 1 – 10, with 10 being the best. Please add any comments that you think would be helpful.